Trust our company for drywall ceiling repair. We are experienced, knowledgeable and skilled. We know how to fix all ceiling problems and we fix them well. “Drywall Repair Valencia” equips its technical teams with tools perfect for patching holes and dealing with imperfections. Despite the high level of difficulty, our ceiling drywall repair experts guarantee perfection. We can assure you that we are available for tiny issues and huge problems and we fix everything equally well. We have great expertise in drywall services and fixing ceilings is part of our job. Anything can go wrong with ceilings. 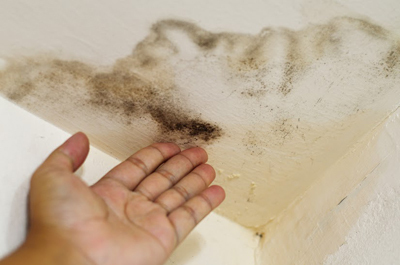 Water damage, wrong materials used during installation and improper hanging of the ceiling would eventually show on your drywall in the form of small imperfections or holes. We take care of everything! 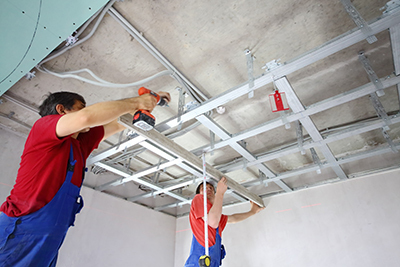 We are experienced with ceiling repair, are always well equipped when we arrive to your property for services and can handle problems of every nature. Our technicians specialize in such services. We all have expert technical knowledge of what must be done in case of a certain problem. As drywall specialists, we don't only have the solutions but we can also give you the reasons for a problem so that you can avoid it in the future. The main thing is that you can count on Drywall Repair Valencia when problems are exactly above your head. We take care of defected drywall corners, replace damaged frames and taping, and find the best remedies for water damage. We are also proficient in popcorn ceiling removal. We don't only remove the old painting with attention not to ruin the surface of the panel but also cover your floors to protect them from drywall dust. Of course, we have the experience to texture your ceilings with new coatings of your preference. As for our techniques, we use modern and environmental friendly processes in order to protect our customers and give them high aesthetical results. Once the drywall ceiling repair is over, we treat the area so that it will look good. We deal with problems efficiently. As ace technicians in patch repair, we guarantee to use perfect replacement parts, for example when we must cut around a big hole and patch it with the new part. We make sure the new drywall replacement is perfectly fastened, sanded and coated so that nobody can tell the difference. When it comes to technical details about ceiling services, we are the best. You can trust us completely but then again we have good taste, too. We will deliver a fixed ceiling that will look at its best. Discover what we can do for you by browsing our website!